It is one of my favorite stories, I've made, mainly because of the characters. I made some of the best characters I've ever created in this story. Since most fan games don't make it very far, before they're shutdown, this is mostly going to be done for a Youtube series on my personal channel. I won't be too picky on quality. The main things I am looking for are great acting and the voice that I imagine fits the best with the character. The story can get very deep and emotional, so definitely needs good actos. Of course, I'm also looking for the typical, cliche attitudes of duelists in the original dub. Sometime after the events of Yu-Gi-Oh! 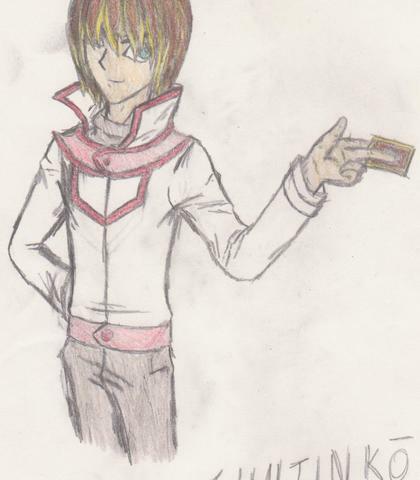 GX, the story now revolves around a senior of Duel Academy, residing in the Slifer Red, lowest of three ranks in the school. Despite being in such a rank, Shujinkō is known across Duel Academy as "The Invincible Duelist," because his Life Points never dropped. This is quite a feat for a student duelist. Some even go so far as to say, he could easily become the next "King of Games," but that's a different story. For now, let's just watch his daily, normal, school life become... not-so-normal. Some elements of the story, some characters, and all cards featured in the story do not belong to me. I retain full rights to most of the story original to me and the original characters I created. Yu-Gi-Oh! and the trading card game based from it is owned by Konami and Kazuki Takahashi. Custom cards not created by me are from Yu-Gi-Oh Card Maker Wiki. Please support the official release, and please do not steal my originals, and enjoy! This first part in the series will be short (only 5 chapters), and I hope that recurring roles will stick around to finish the series. If anyone needs help with character name or card name pronunciations, I will be happy to guide and assist! I will be available almost any time to give direction. I also will give fair, constructive criticsm to anyone that auditions, so be ready. Lastly, I look forward to working with you all, and I think this will be an awesome project, once we get the ball rolling! Thanks for all your support, in advance! One of the main supporting characters of the story, Snow is smart and talented. 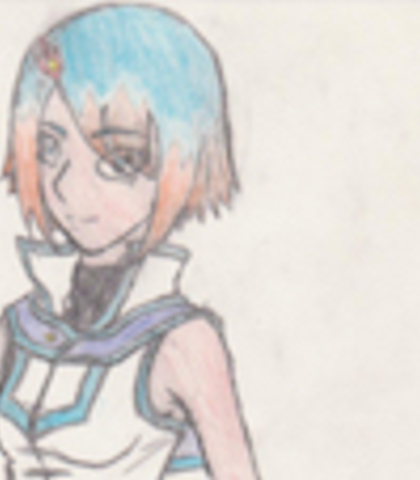 She has had an interest in Shujinko since they both entered Duel Academy, their Freshman year. As she gets to know him, she begins to develop a love interest in him. She does not show this love interest completely, but she is definitely not afraid to flirt with him. She is a go-getter and very confident in herself and her skill. She's not afraid of anything, and is a bit of a rebel. "Yeah... He is pretty interesting. He always has been, ever since his entrance exams. (in agreement with Ina about Shujinko being a cool duelist)"
"I'll leave your head spinning with my mix of Fire and Water! Let's go!" "Told you, he'd be chill with it. Now, quiet down, and help me sneak him in." The main protagonist of the story, the infamous "Invincible Duelist" of Duel Academy, he has never lost a single Life Point in any of the duels he has competed in during his entire four years at Duel Academy. He is very smart and strategic, but also very cocky. He believes in and cares greatly for his friends. He is very blunt with words. He is also very aware of what goes on around him and has a strong connection to the spiritual. Aside from his strong cockiness, he is always serious and ready for anything. Sometimes, he can be a tad bit sarcastic. The characteristic that stands out most about him is that he explains things in large, full detail. "You don't know that. Take a chance, Snow. Never give up. (encouraging Snow when she knows she's surely been beaten)"
"Well, you know, Mia. If you're not happy, then the answer to your question about how I am would be the same. I'm not happy either, if you aren't. (comforting Mia)"
"I've lost... (in defeat, losing his mind to the shadow Realm)"
A supporting character, and the son of Joey Wheeler, he has the same personality and accent as Joey. "Airon! Aye, Airon! Professor Fein stole da forbidden 'Exodia' cards and escaped into da sacred tomb on da other side of da island! We need your help to nab him before he gets away!" "Aye, aren't you 'da Invincible Duelist?' (meeting Shujinko)"
A main supporting character, Airon is a calm, cool, and collected duelist with a strong sense of the spiritual, passed down his family blood line. He is close with Hakumai, and they are almost always together. He has an interest in dueling Shujinko to test his skill. Always serious and a skilled duelist. "The famous Shujinko. What an honor." "You and Mia... together you two are incredibly strong opponents. Congratulations. It was an honor to test out the skills of 'The Invincible Duelist.'" "What?! The Headmaster of Ra Yellow?! I had full trust in him... Thanks, Junior. I'm going after him!" Ina is a minor supporting character, and is the best friend/roommate of Snow. She is shy and a bit timid in nature. She can be easily surprised or changed in mindset. Average in dueling skill and grading at school. 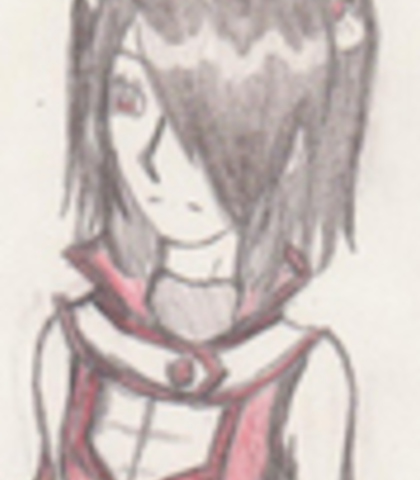 She does not agree with Snow's rebelliousness, and prefers to stay out of trouble. Rusty tends to get on her nerves. So she is also a tad bit violent. "I don't know Snow, I don't wanna get caught with a boy in our room..."
"Whoa! Holy cow, Snow! You actually brought him; you're crazy!" A major supporting character that is very affectionate, but shy. She is very soft spoken and her confidence never really shows until she is dueling. She is in love with Shujinko for saving her in her Freshman years. She was bullied for only getting into Duel Academy because she was from a family of royalty in Japan. They're bond is so strong, when Shujinko is in trouble, she can feel it, and worries about him. She witnesses Shujinko's first and last defeat and tries to save him, but is too late. She is completely devastated when she loses him to the Shadows. Any accent is fine, but go for a Japanese accent, just to try it out. I just had the idea recently, and I think it would make her more distinguished. "I just wanted to be away from everyone for a while... and... I had a feeling you might be here. (to Shujinko)"
"I know you can do this, my Shujinko... I know you'll win...just be careful." A minor supporting character and the biggest bully at Duel Academy. He picks on anyone under him in ranking and enforces the rules of the school just to look good. He is overconfident and is totally "brawn over brains." Very masculine. "You two shouldn't be on Obelisk Blue's turf! You better leave, now!" "Look out ladies, I'll teach this loser to know where he's at on the food chain. Let's duel, kid." A minor supporting character, she is a smart and quiet young lady who is almost always in worry, because of her strong bond with the spiritual. She is in love with Airon whom she is almost always around. After seeing Shujinko, she believes in him greatly. She is a very caring and friendly person, when she gets to know someone. "Airon, do you feel that? There's a strange feeling in the air." "Wait, what are you doing?! Don't be a hero, Shujinko! Fein has a deck down there that contains Exodia and who knows what else! A single wrong move will cost everyone on this island including you!"